The premium touch of the entire Bonneville range is present in the details, including unique gun-metal finish engine badges, real brushed aluminium tank logo decals and black headlight bezel. There’s been a major step forward from the previous generation Scrambler in regards to engine, exhaust and rider focused technology. All combining to give more performance and a better riding experience from the new Street Scrambler. 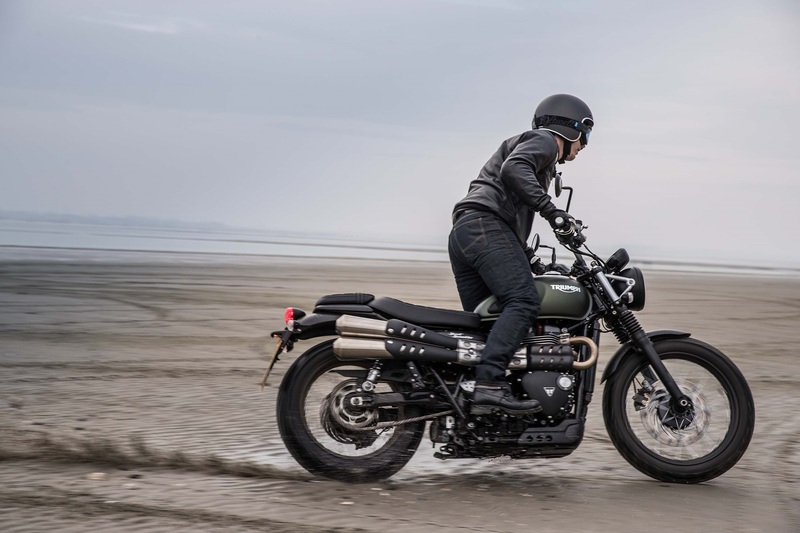 Fitted with the critically acclaimed 900cc Bonneville high torque engine, the Street Scrambler delivers much more torque and power low down and in the mid-range, perfect for around town and light off-roading. A key update to the original Bonneville engine platform, the 900cc engine features a charismatic 270° firing interval for smooth, linear power delivery from the slick five-speed gearbox. Enhanced throttle response from Triumph’s ride-by-wire fuel injection and cutting-edge liquid cooling system have been carefully integrated into the unique style of the Street Scrambler. This reduces fuel emissions and significantly improves fuel efficiency whilst providing smooth and precise drive for a higher level of control and rideability. This, combined with a new extended service interval of 10,000 miles (16,000km) dramatically reduces the overall cost of ownership. The all new, more compact, high level twin Scrambler exhaust in beautiful stainless steel delivers a unique scrambler soundtrack, authentic scrambler style and features an intricate header run that cleverly integrates the cat box and is finished off with brushed stainless steel silencers with stylish contrasting black heat shields. Ride-by-wire Enhanced rideability, safety and control, from a single throttle body. Switchable ABS A unique feature on the Street Scrambler that reinforces its capability is switchable ABS, accessed via the instrument menu. Liquid cooling For cleaner and more fuel-efficient riding (up to 36% better fuel economy). LED rear light Incorporated into the classic design, it creates a distinctive light pattern with enhanced power efficiency. Engine immobiliser Thatcham approved immobiliser with a transponder incorporated into new key. 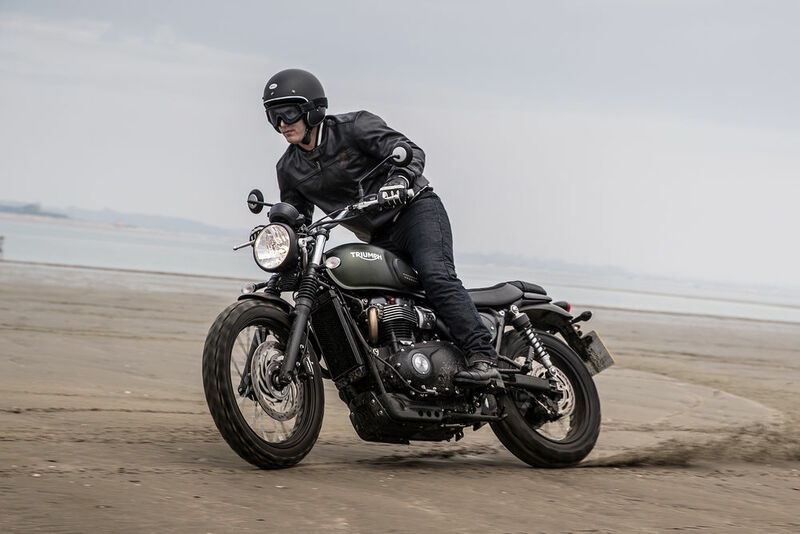 With a dedicated new Scrambler chassis and suspension, the Street Scrambler has had a major upgrade to its capability and has been given more dynamic Scrambler poise. Just like the Street Twin the new Street Scrambler chassis set-up is tuned to deliver a neutral and predictable ride. This, combined with the same confidence inspiring evolution to “stand-over” ergonomics for manoeuvrability and seat height considerably lower than the previous model, makes it a really accessible and fun bike for every type of rider. Contributing to the commanding riding position and signature silhouette are the new model specific front forks and rear suspension units which raise the back end for addition ride height, wider tapered aluminium handlebars and classic larger sized wire spoked wheels. The new Street Scrambler comes with a large 19’’ wheel on the front and 17’’ wheel on the rear both of which have stylish steel blacked out hubs and rims. A further increase in specification comes from the new high value 2-piston sliding axial Nissin caliper with machined branding. Just like the Street Twin, the new Street Scrambler has been designed with personalisation at its heart and has more than 150 accessories to deliver more rugged off road focus, more style and more everyday usability. The off-road accessories include, adjustable rear piggy back FOX shocks with threaded preload adjustment and 24 position compression damping, black glass-filled nylon headlight grill with a pressed steel matt black finish bezel, and a forged and machined aluminium handlebar brace in a black anodised finish (fitted with a stylish black or brown vinyl bar pad embroidered with the Triumph logo). For even more style the accessories range include slip on Vance and Hines single exit silencers, a traditional scrambler twin bench seat and 70mm diameter bar end peep mirrors in anodised black or clear aluminium with a laser etched Triumph logo. For everyday usability, there are internally wired heated grips available along with a steel fabricated centre stand kit, an auxiliary power socket and cockpit mounting kit and highly durable engine bars.